Google has launched the Youtube AdBlitz Super Bowl 50 Ad channel. AdBlitz 2016 is already containing some Super Bowl 50 ad teasers. There are only four teasers. Two of them are from Wix.com, which we featured a week ago. Then there are two KFC commercials. There is no word anywhere that a KFC Super Bowl 50 commercial is part of the Super Bowl 50 Ads. Either YouTube knows something nobody else knows, or the KFC commercials do not belong on AdBlitz. 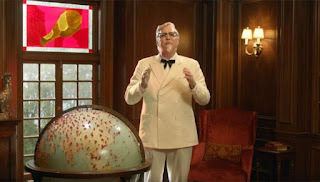 KFC has launched the new Nashville Hot Chicken and released two new commercials with the new colonel Sanders this month promoting the new flavor. The new KFC Nashville Hot chicken is has launched in restaurants nation-wide on Monday, Jan 18. As KFC just launched a new product, it would be fitting to promote it with a Super Bowl commercial. So far though a KFC Super Bowl 50 ad is unconfirmed. Watch the two new KFC commercials below that Youtube classifies as Super Bowl Ad teasers.